Tame your messy desk with buckets! This is typical of right-brained, creative free-thinkers, who balk at traditional filing systems. To them, file drawers are gaping black holes from which nothing can ever be retrieved. They think visually, and if something is not right in front of them, it ceases to exist. The difficulty is that they are also troubled by visual clutter. The more visually chaotic the the working surface becomes, the more distracting it is and harder to function productively. Your brain is constantly scanning your work surface to determine what is worthy of attention. That’s mentally exhausting. For many of my clients the biggest stumbling block to managing papers is categorizing them. Traditional filing systems categorize in hierarchies – broad categories that are sub-divided and sub-divided into more and more detailed subjects. For example, you may have a broad category called HOUSEHOLD with an AUTO sub-category divided into INSURANCE, REPAIRS, REGISTRATION and PAYMENTS. You might also have a category for FINANCE under which you’d find BANKING, INVESTMENTS, INSURANCE, and LOANS. If you were looking to file the latest payment for your car insurance, would you look under Household or in Finance? What about the car payment? That’s a Loan, but it is also an expense under Auto. At this point, you throw your hands in the air and drop the paper back on the pile on the desk. A messy desk is not the end of the world! 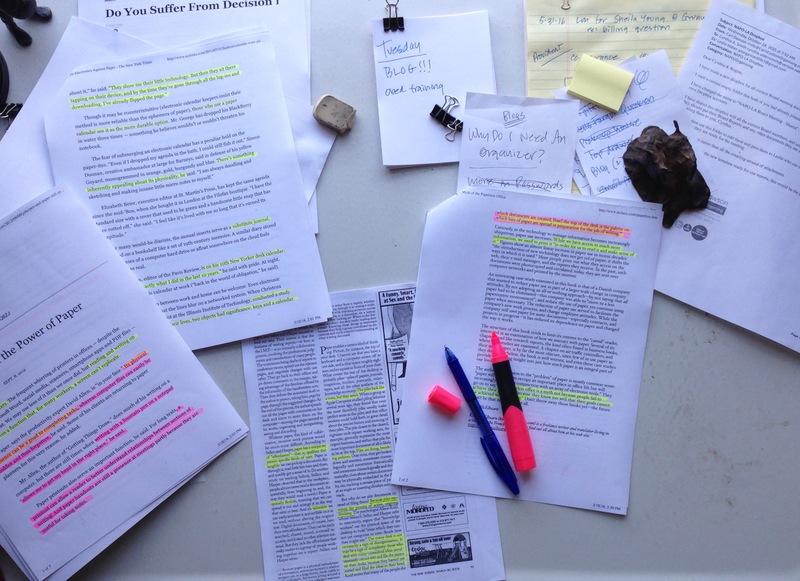 It may sound like heresy, but an array of papers on your desk can represent an array of ideas in your mind. Physically moving the papers can be a way to shift relationships between ideas which can result in unforseen solutions. …an array of papers on your desk can represent an array of ideas in your mind. On a computer desktop, it’s difficult to lay out documents, notes and post-its so you can see everything. More and more of us are working on laptops and tablets with even smaller screens. Moving and re-arranging things physically is sometimes the best way to order your thoughts. That’s fine while you’re working, but you need to be able to contain them when not actively working; or at least to separate current projects from completed projects or reference material. Which brings us to buckets. What I call buckets are holding pens for current activities. For example, I keep a wire file basket next to my computer where I dump anything that requires computer work. There are people I need to add to my contacts, an ad with a URL I’d like to check out, handwritten notes that need to be typed, recipes to find and bookmark online, cards with coupon codes, etc. It’s not neatly organized because it’s all in flux — once something is in the computer, whatever it was written on can be tossed. If I need to find something, it’s easy to dig through. I don’t care if it looks pretty. It’s a bucket. The idea is to be able to scoop up your current work and stash it somewhere handy when you’re not actively working on it. It’s a receptacle for documents and relevant bits of paper or information. For example, if you are in the process of buying a sofa, you’ll have pictures torn from magazines or catalogs, fabric samples, printouts of items you’ve found online, business cards or brochures from stores, handwritten notes, or even a working floor plan. You can spread everything out on your desktop when you are working it. Once you’ve made your purchase, you can throw most of it away. Make a bucket for action items like bills to be paid, or for upcoming journeys, or for long-range planning. Anything that has multiple or inconsistent pieces of relevant information can be tossed in your bucket. Magazine files make good buckets. So do file trays, document boxes with lids, desktop file boxes, newspaper bins, clear plastic men’s shoe boxes, really anything that can hold either a file folder or letter sized paper will work. You want something that can be labelled, will look neat on your work surface and is not too large. Your projects will be readily accessible but contained. Once a project is completed, you should discard anything that’s no longer relevant and keep only the information you may need for reference in the future. Ideally, you will only need to keep one or two documents. Those can go into a file drawer. You don’t even need to make pretty hanging files. 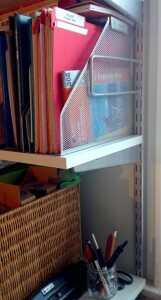 Simple accordion files will sit upright in a file drawer, or side by side on a shelf work just fine. As long as you label clearly, the package doesn’t matter. Next post: The Paperless Office: Myth or Reality?